At Guilty, we know that secure and speedy delivery is important and we send virtually all of our products by Royal Mail Special or Signed for Delivery. Guilty Bangles offers a Free Signed For Delivery Service on all items purchased to the majority of the Great Britain, Northern Ireland and the Republic of Ireland, you don’t have to pay a penny! When you order any product from Guilty Bangles, the special delivery service is free and no delivery charge will be added to your purchase! Free Delivery Means FREE - You do not have to pay a delivery charge! Orders despatched within 48 hours at the LATEST excluding weekends. FREE includes signed for and special deliveries! 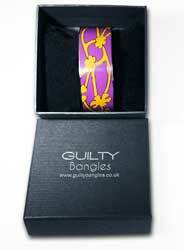 The same free delivery policy applies to all personalied engraved bangles supplied by Guilty. However, the delivery times are slightly longer, please allow 5 working days for your order to arrive. Why do Guilty Bangles offer free delivery? The free standard UK delivery service offered depends on the value of the products purchased and will typically involve a standard Royal Mail First Class or ‘Signed For’. Our orders are dispatched within 48 hours after purchase, excluding weekends, and are usually delivered within three working days after dispatch at the latest, typically within two working days. If you need a really fast delivery, this is no problem as we understand that speed is important, we can usually get your bangle to you within 48 hours of order, excluding weekends. Delivering your bangle as a present is no problem, just specify an alternative shipment address in your order. We can also send the receipt to an alternative address and include a personalised message if required as well as removing price tags. Guilty Bangles delivers to a large number of countries including the whole of the European Union and virtually all other non EU countries and Scandanavia. We are also happy to deliver to Australia, New Zealand and the USA and Canada. If you have any queries though, please contact us first and we will be more than happy to provide delivery times. Virtually all of our international deliveries are tracked so that we can ensure that your bangle is delivered. There is a flat fee of £5 for any international delivery, please choose your country in the checkout process and click on the international delivery button in the shipping segment of the checkout process. We want you to enjoy your bangles as much as we do. This is why every bangle you buy from us will arrive to you in its own bespoke, Guilty Bangles branded gift packaging. Whether it's a gift for you or for a loved one, the presentation box not only protects your new bangle, but also presents it in the best possible way. Depending on the bangle you buy, you will receive slightly different gift packaging. For example, if you purchase one of our gorgeous silver slave bangles, you will receive the flat bangle box pictured below. Alternatively, silver cuffs and wider silver bangles are usually packaged in one of our larger branded boxes with a cushion insert like the box below. The lid slots firmly onto the bangle and provides a long term protective box as the cushion holds the bangle in place.